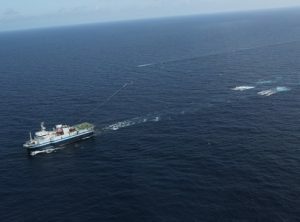 Seismic survey vessel with trailing acoustic array. Nowacek and colleagues publish paper on responsible practices for seismic surveys. The paper, published in the current issue of the journal Aquatic Mammals, was the result of a collaboration between scientists with the Switzerland-based International Union for Conservation of Nature (IUCN)’s Western Gray Whale Advisory Panel and the Russian consortium, Sakhalin Energy Investment. Numerous news articles published, including by Reuters, National Geographic, and the American Academy for the Advancement of Science (AAAS).